The central assertion of this book is that states pursue social actions to serve self-identity needs, even when these actions compromise their physical existence. Three forms of social action, sometimes referred to as a??motivesa?? of state behaviour (moral, humanitarian, and honour-driven) are analyzed here through an ontological security approach. 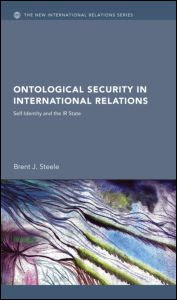 Brent J. Steele develops an account of social action which interprets these behaviours as fulfilling a nation-state's drive to secure self-identity through time. The anxiety which consumes all social agents motivates them to secure their sense of being, and thus he posits that transformational possibilities exist in the a??Selfa?? of a nation-state. The volume consequently both challenges and complements realist, liberal, constructivist and post-structural accounts to international politics. Using ontological security to interpret three cases - British neutrality during the American Civil War (1861-1865), Belgiuma? ?s decision to fightGermany in 1914, and NATOa? ?s (1999) Kosovo intervention - the book concludes by discussing the importance for self-interrogation in both the study and practice of international relations. Ontological Security in International Relations will be of particular interest to students and researchers of international politics, international ethics, international relations and security studies.